Factory Sealed 2015 Topps Series 2 Baseball Hobby Box mit 36 Packs a 10 Cards per Pack. 1 Autogramm oder 1 Relic Card per Box !! Finde Kris Bryant - Chicago Cubs Rookie Cards ! 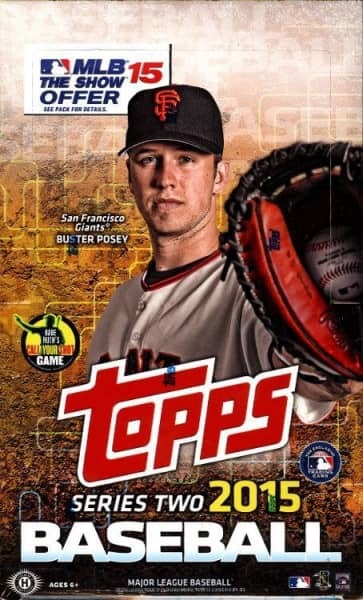 Produktinformationen "2015 Topps Series 2 Baseball Hobby Box MLB"
Auf dem Box Cover befindet sich Buster Posey - Catcher der San Francisco Giants !!! 2015 Topps Baseball Series 2 wraps up the biggest base set in a decade! With the 350 base cards in Series 2, collectors can complete their 2015 base set of 700 cards! Returning are all the big hits from Series 1, including Strata Signature Relics and the Hobby box exclusive clear parallel of the entire base set. New additions include inserts, autographs, and relics with a renewed focus on great moments in the game and the players who made them happen. Key Rookies: Kris Bryant, Archie Bradley, Jung Ho Kang, Yasmany Tomas, Devon Travis, Ryan Rua, Matt Szczur, Roberto Osuna, Hunter Strickland, Chris Heston. The biggest base set in a decade continues! 350 base cards, featuring Veterans, Rookies, Future Stars, Award Winners, 2014 Baseball Highlights, and Team cards. * Gold - Sequentially numbered to 2015. * Snow Camo - Sequentially numbered to 99. * Black - Sequentially numbered to 64. HOBBY & HOBBY JUMBO ONLY. * Pink - Sequentially numbered to 50. * Platinum - Numbered 1/1. * Rainbow Foil Parallel - Inserted 1:10. * Framed Parallel - Framed in silver, similar to Museum Collection autographs. Sequentially numbered. HOBBY & HOBBY JUMBO ONLY. 1 PER CASE! * Base Card Printing Plates - The four printing plates used for every base card, 1,400 total plates. Numbered 1/1. HOBBY & HOBBY JUMBO ONLY. * Stepping Up Featuring 20 players and a time they came up big in the clutch. Inserted 1:6. * Highlight of the Year The Highlight of the Year insert continues from Series 1 with 30 more highlights. Inserted 1:4. * Eclipsing History 15 dual-subject cards featuring a current record-holder and the Legend of the past he eclipsed to claim that record. Inserted 1:10. * Baseball Royalty 25 of the greatest of all time. HOBBY & HOBBY JUMBO ONLY. 2 PER BOX. Baseball Royalty Gold Parallel - Numbered to 99. HOBBY & HOBBY JUMBO ONLY. * Heart of the Order Featuring 20 of the greatest sluggers of all time, discussing how their lineups were built around them. Inserted 1:6. * ...'Til It's Over Featuring 15 of the greatest comebacks of all time. Inserted 1:8. * STAMPED BUYBACKS Vintage Topps cards stamped with a buyback logo. HOBBY & HOBBY JUMBO ONLY. 2 PER BOX. 1 per HTA Jumbo box! 1 per standard Hobby case! * COMMEMORATIVE PATCH PINS Featuring stunning metalized recreations of some of the most iconic patches ever to adorn an MLB jersey! Sequentially numbered to 199. * COMMEMORATIVE BAT KNOBS Recreations of the bat knobs of 25 of the biggest stars in Baseball. Commemorative Bat Knobs Black Parallel - Featuring a black bat knob. Numbered to 99. Commemorative Bat Knobs Pink Parallel - Featuring a pink bat knob.Numbered to 25. MLB and a coin and stamp from the year of their birth. Quarter with Stamp - Numbered. Quarter with Stamp and Autograph - Numbered to 10. Dime with Stamp - Numbered. Nickel with Stamp - Numbered. Penny with Stamp - Numbered. * Stepping Up Autograph Relics - Numbered to 10. * Highlight of the Year Autograph Relics - Numbered to 10. * Eclipsing History Dual Autograph Relics - Two autographs and two relics per card! Numbered to 10. * Baseball Royalty Autograph Relics - Numbered to 5. On-card! * Heart of the Order Autograph Relics - Numbered to 10. * ...'Til It's Over Autograph Relics - Numbered to 10. * Strata Signature Relics - Numbered to 25. * Career High Autographs Autograph cards recognizing statistical career highs of stars of yesterday, today, and tomorrow. * Stepping Up Autographs - Numbered to 25. * Highlight of the Year Autographs - Numbered to 25. * Eclipsing History Dual Autographs - Two autographs per card! Numbered to 25. * Heart of the Order Autographs - Numbered to 25. * ...'Til It's Over Autographs - Numbered to 10. * Strata Cut Signatures - Numbered 1/1. * Career High Relics Relic cards recognizing statistical career highs of stars of yesterday, today, and tomorrow. * STEPPING UP Relics - Numbered to 99. * Highlight of the Year Relics - Numbered to 99. * Eclipsing History Dual Relics - Numbered to 50. * Baseball Royalty Relics - Numbered to 25. HOBBY & HOBBY JUMBO ONLY. * Heart of the Order Relics - Numbered to 99. * ...'Til It's Over Relics - Numbered to 25. * Own the Name Relics Featuring letters from game-worn jersey name plates. Numbered 1/1. HOBBY & HOBBY JUMBO ONLY. * Babe Ruth's Call Your Shot Online Code Card - Every 10th pack will offer collectors their choice of a chance for a veteran or retired player autograph card, an autograph relic card, or a sweepstakes entry. Inserted 1:10. Weiterführende Links zu "2015 Topps Series 2 Baseball Hobby Box MLB"
Fanbewertungen für "2015 Topps Series 2 Baseball Hobby Box MLB"